We love healthy, delicious, feel-good desserts. What do we love even more? When you can make them in 5 mins or less. Dates are a good source of healthy vitamins and minerals, and fiber. They are also loaded with calcium, iron, phosphorus, potassium, magnesium and zinc. 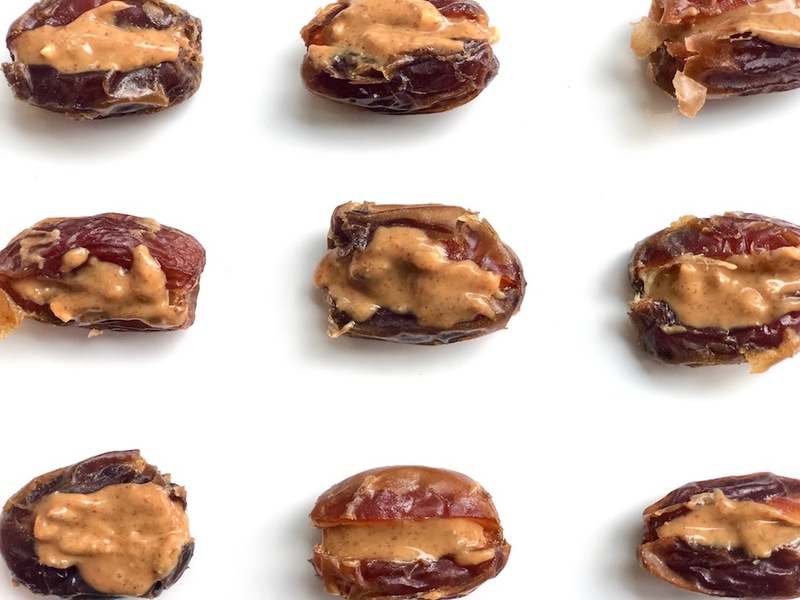 The chewy sweet flavor found in dates pairs perfectly with the nutty taste from almond butter, making for a simple yet satisfying sweet treat. What’s also great about this recipe (besides the simplicity) is that it is gluten free, and vegan, YAY! If you’re feeling adventurous, try dipping these stuffed dates in your favorite melted chocolate, and refrigerate for a chocolatey shell coating. Slice length-wise the date and remove the pit from each one. Open the date wide and using a small spoon add about 1/2-1 tsp of nut butter to each date. When you’re finished with all of the dates, place the tray or dish in the freezer and allow to set for 10-15 minutes. Want more yummy desserts? Click here!